Our Goodwood renovation project gave a 1985 Victorian meets Contemporary townhouse new life with a complete redo. 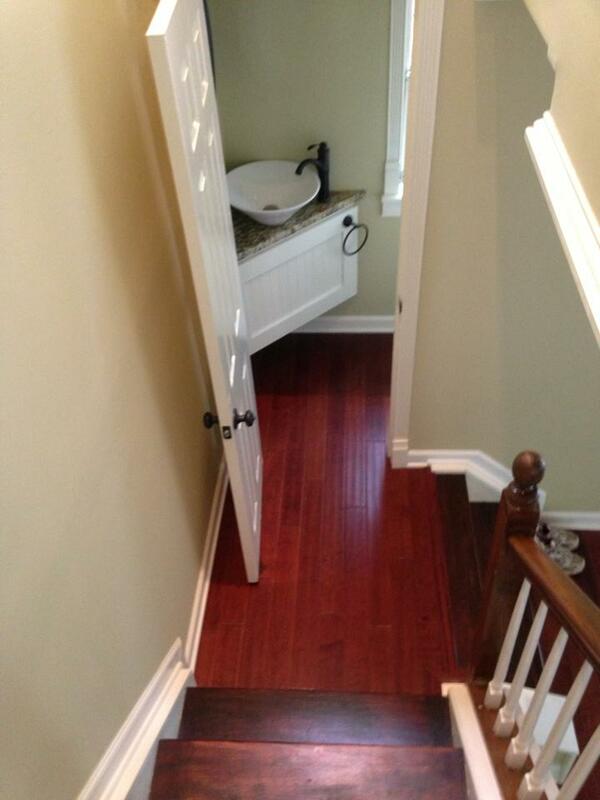 One of the most rewarding projects was the main level powder room, which sits just off the dining area. Just 3 by 8 feet and with a sloped roof, it is a tiny space. 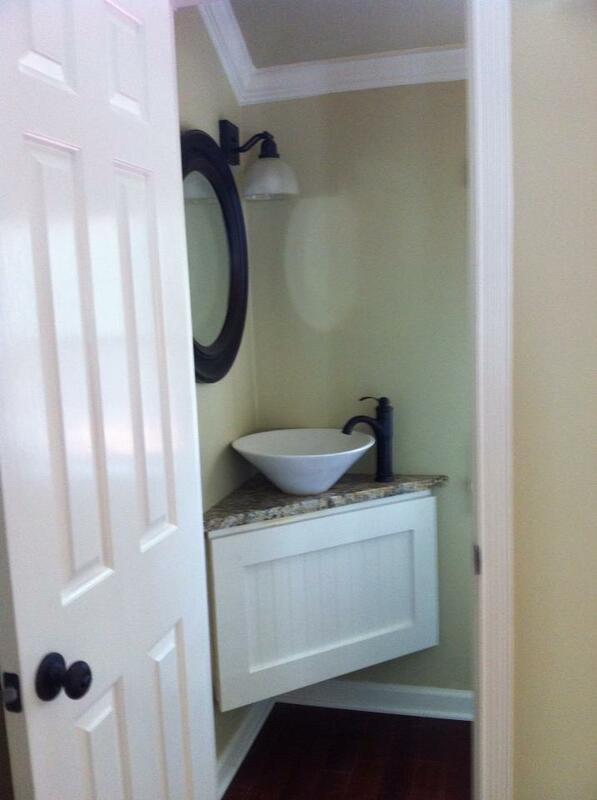 The powder room is tiny. Just 3' by 8'. The door was originally in the center of the room, and awkwardly opened onto the dining area. The key to making it work was moving the door from the center of the room to the corner, and then adding a corner vessel sink to give enough room to get in and out. The original architecture put the door to the space more or less in the center of one of the 7 foot walls, with a cultured marble pedestal sink to your left, and the toilet to the right as you entered the room. Unfortunately, that made the door open directly on the dining area. Awkward! To fix the issue, we moved the door to the left, sliding it more fully into the stair case that sits just behind the dining area. 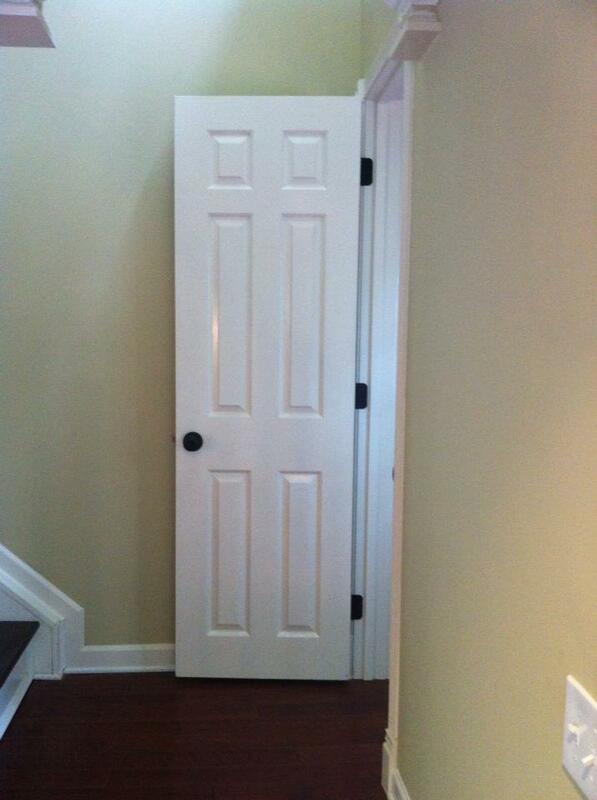 The new problem was that now the door opened right on the space for the pedestal. The pedestal blocked you from entering the room. Our solution, a corner sink. We moved the door to the powder room over to the left, so that it would be completely in the stair well, and out of the dining area. We extended the hand-scraped maple floor into the room to help with flow. Adding a dark bronze towel ring to the cabinet was a final touch. With the room being so small, it was really the only place we could put it! Did you know that sourcing a corner sink is darn near impossible? The ones you find are either tiny fixtures, sized for a yacht, or really ornate pieces of furniture, which are too big for the space and didn't fit with the contemporary style we were going for. Moreover, they were really outside our budget. So, we went completely custom and created a cabinet that attached to the wall. We fronted the cabinet with a shaker-style panel, with a bead-board field. We painted the cabinet the same antique white color as the house trim. Don't forget, Kilz primer and two coats of semi-gloss. The completely custom corner vanity is simply constructed from one-by materials. The front panel is shaker, following the design of the espresso-stained kitchen cabinetry. The granite was machined using a template we made from cardboard to fit the wall exactly. The vessel sink and faucet were found on amazon, at really great prices. 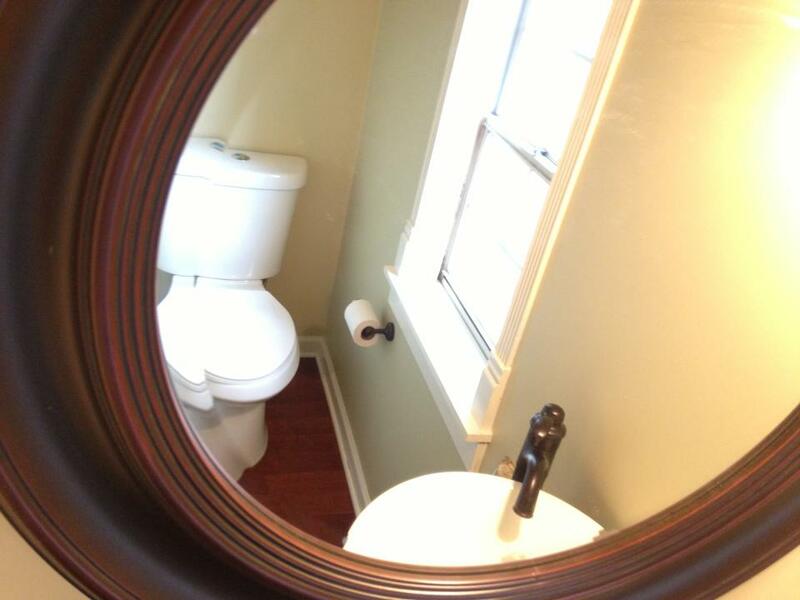 The mirror and light were from home depot. On top, we added a custom cut piece of granite that matched the St. Cecilia stone in the kitchen. To get the granite just right, we created a template from cardboard, cutting to the exact dimension it needed to be. We added holes to the template for a white porcelain vessel sink and for the faucet, both of which we purchased ahead of time on Amazon. To finish the room, we extended the hand-scraped maple floors from the hallway into the powder room, added a new low water usage toilet, added crown molding - not so easy on a sloped ceiling - and added a circular cherry-framed mirror and bronze sconce light. We trimmed the room out with the dark bronze hardware we used throughout the house. The high contrast dark bronze hardware on antique white trim runs throughout the house. The end effect is a refined room that makes the most of the little space available. Granite: $75 - a triangle about 2.5 square feet at $24 per square foot. We picked it up from the granite manufacturer and installed ourselves to keep cost down. Toilet: $105 - includes water supply.